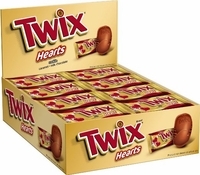 Twix hearts is the perfect Valentine candy for everyone. After all who doesn't like chocolate, caramel and cookies, plus they are in the shape of a heart. Buy twix hearts for your special Valentine. Each box has 24 twix candy bars individually wrapped.